1722 Federal Republic of Germany / se-tenants - 1951 / 91, very nice and extensive mint never hinged collection en masse ring binder clean made up with numerous better combinations, with also posthorn including gutters, Heuss extensively present with many different combinations and stamp booklet panes, thereby also very good part watermark sideways with good combinations the 8 Pfg., as well Brandenburg Gate, all se-tenants olympic games 1972, prevention of accidents perforated and partially perforated, castle and palace and so on. A magnificent object! 1729 ⊙ Federal Republic of Germany - 1949 / 55, very nice used lot of the early years with plenty of better issues, good welfare series and so on, all round cancelled as well Lower House of German Parliament 1949 four times, 100 years stamps with 13 top values, Stephan five times including one corner of the sheet with date of printing, welfare 1949 five times and once again the key value triple, Bach seals three times, St. MaryÂ´s Church six times, Wuppertal series four times, welfare 1951 three times and additional the key value double, youth 1952 five times, welfare 1952 twice, welfare 1953 three times and the key value additional triple, as well further better issues. A magnificently lot! Michel approximate 7970,- €. 1733 / Federal Republic of Germany - 1949 / 72, complete collection in the lighthouse hingeless illustrated album with all beginning valued including Lower House of German Parliament 1949, 100 years stamps, all sets helper of human resources, St. MaryÂ´s Church, posthorn set, Heuss 1954 and so on. Favorable! 1744 ✉ Federal Republic of Germany - very interesting and nice special collection of the issue \"transport exhibition 1953\" with numerous covers, cards and first day letters in the ring binder accommodated. As well lovely documents, numerous set frankings, registered, various cancellations, special cards, nice jewellery covers and so on. There are 31 complete sets included! 1793 1881 Federal Republic of Germany - 1949 / 2000, fantastic mint never hinged special collection in five Lindner ring binder and a spring back binder formed with a large number of rare issues. 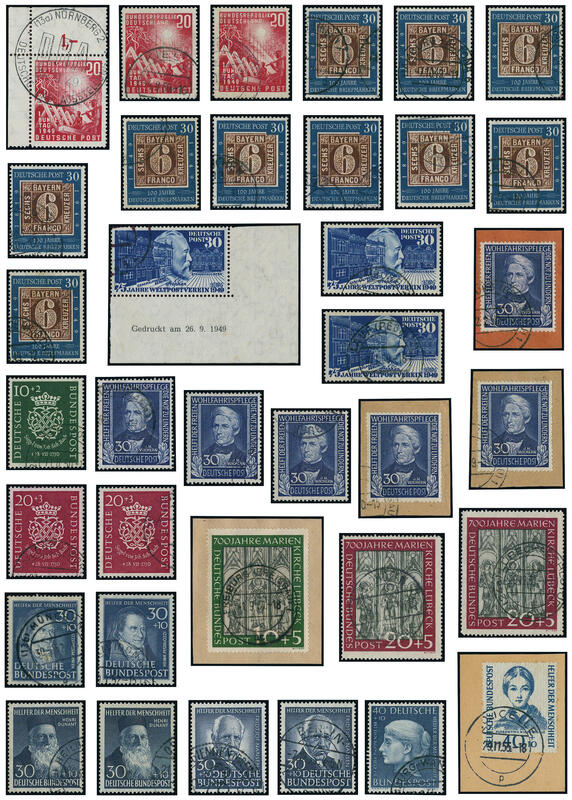 The collection is in the number of a major listing more then complete mint never hinged available. Special notice earns the enormous portion varieties with numerous extraordinary copies. As well for example numerous distinctive perforation varieties from the sixties years including rarely issues, offsets, the scarce not issued stamp Christmas 1969 (so-called \"chubby\") with overprint \"sample\" in perfect condition mint never hinged with photo certificate \"perfect quality\" Schlegel BPP. Furthermore also a very nice part se-tenants and stamp booklet from Heuss with useful issues at the MH2. Also numerous unperforated values are available, as well also missing prints. 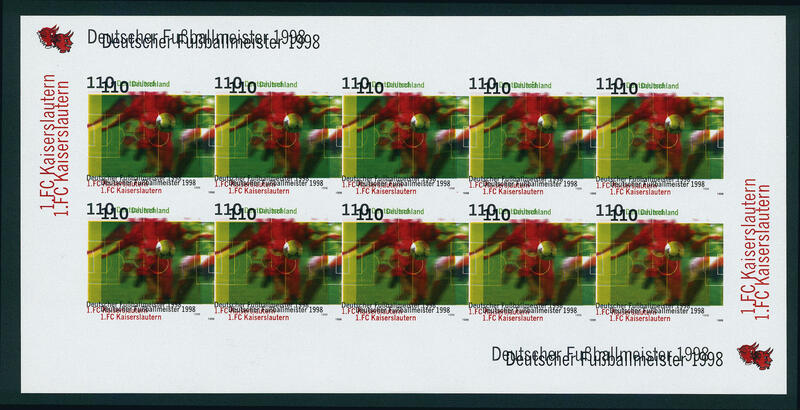 With also the Bamberg miniature sheet 1996 with perfect missing printing (Michel no. 1881), Lilienthal souvenir sheet 1991 strong damaged in cutting in perfect condition mint never hinged with photo expertize Schlegel BPP, Kaiserslautern stamps 1998 unperforated with complete miniature sheet showing a double print, 300 Pfg. Country chapel Dresden 1998 in the unperforated block of four and enormously much further material. A magnificent object, which for many years with an enormous capital expenditure formed was! 1797 /⊙/ Federal Republic of Germany - 1949 / 97, enormously extensive inventory in 14 large, mostly thick stock books accommodated, all clean organized and predominantly mint never hinged respectively used, very few unused. Many is close one above the other puted, with also numerous corners of the sheet, special feature and so on. Also the first issues are abundant be present. With also Lower House of German Parliament 1949 four times, 100 years stamps 1949 twice, Stephan three times, welfare 1949, numerous posthorn values, St. MaryÂ´s Church, youth 1952 twice, welfare 1952, transport exhibition 1953 twice, Ifraba twice, welfare 1953 twice, Heuss fluorescent seven times, welfare 1954 six times, welfare 1955 three times, as well enormously much further material. Perfect for liquidation, very favorable! Michel approximate 45000,- €. 1799 ⊙ 1854 Federal Republic of Germany - 1949 / 2002, superb used collection, specialized formed in four large albums. As well are the issues except for few insignificant values in the number of a major listing complete available including all beginning valued. Additional are as well many special feature available. 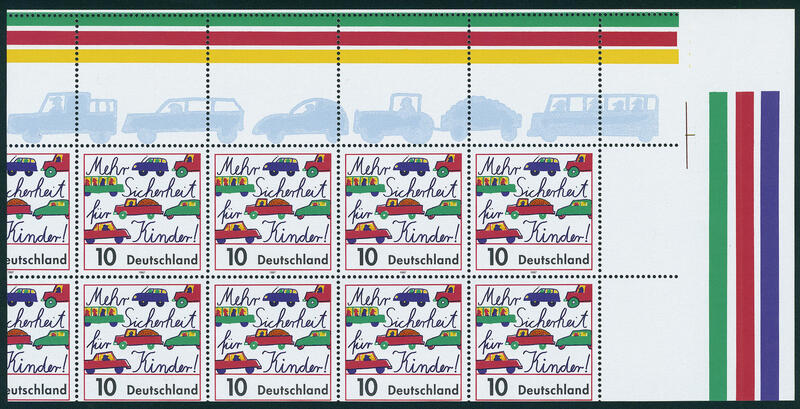 With also Heuss fluorescent on registered cover, Heuss watermark sideways in the se-tanant stripe from margin neat cancelled expertized Schlegel BPP, an enormous number of corners of the sheet, often with beautiful centered first day cancel`s, with also corrected sheet value counter, numerous form numbers, Michel no. 1854 from corner margin extremely strong with defective or badly placed perforation on piece with photo expertize Schlegel BPP, as well once again as strength defective or badly placed perforation on cover, Bodden landscape souvenir sheet 1996 with strong defective or badly placed perforation and appropriate first day special cancel and so on. A very nice and versatile object! 1808 x Federal Republic of Germany - interesting and extensive inventory packed in a carton with a lot of material mounted on pages, stock cards and so on. As well better issues of the early years as for instance 100 years stamps, welfare 1949, welfare 1954, welfare 1955 five times mint never hinged including horizontal pairs, postal stamps, with also corners of the sheet and form numbers, se-tenants, souvenir sheets and so on. Favorable treasure trove! 1847 x Federal Republic of Germany - 1949 / 80, very extensive inventory in glassine-bags packed in a carton with enormous amount of material, from the beginning years, with also 20 Pfg. Lower House of German Parliament three times, numerous posthorn values, often in larger numbers of pieces, special- and welfare issues from the fifties and so on. Huge catalogue value, unchecked for plate errors and so on. Favorable! 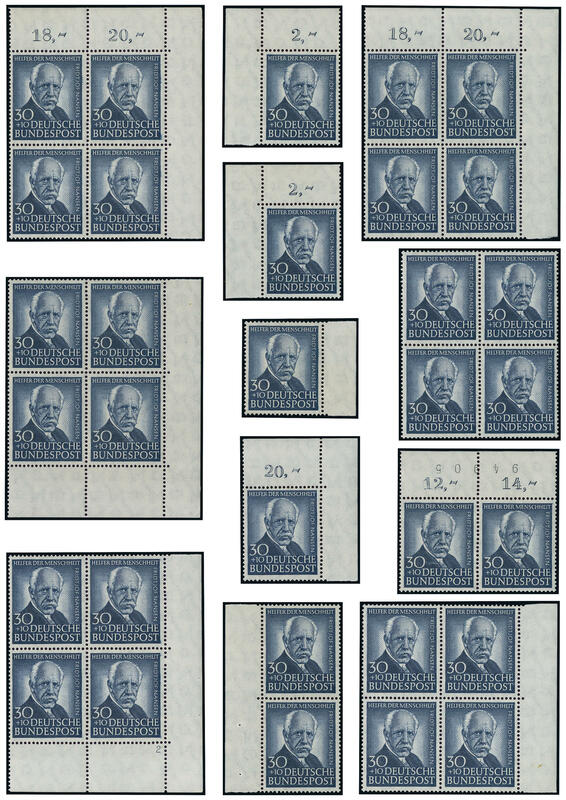 1848 Federal Republic of Germany - 1957 / 94, huge inventory mint never hinged issues in multiples, large parts of sheets respectively complete original sheet in 61 sheet folder accommodated. As well a huge number of special- and commemorative issues, enormously many welfare and youth sets, postal stamps including high values and so on. Unchecked for plate errors and so on. Michel approximate 50000,- €. 1857 ✉ Federal Republic of Germany - interesting lot from covers, cards and postal stationery in the box, as well 30 Pfg. Stephan 1949 with additional franking Federal Republic of Germany / American/British Zone on C. O. D. Cover, 10 Pfg. St. MaryÂ´s Church on blanco card with special cancel, welfare 1955 with additional franking on registered cover, Beethoven-block on registered cover and so on. Favorable! 1863 /⊙/ Federal Republic of Germany - 1949 / 74, extensive inventory en masse thick stockbook accommodated, including numerous better issues of the early years as for instance welfare 1949 twice, Bach seals, St. MaryÂ´s Church, numerous posthorn values, welfare 1951, welfare 1952 twice and additional the key value six times, 30 Pfg. Welfare 1953 twice and many further issues, mixed quality, with much perfect material. Very favorable valued! 1869 FDC Federal Republic of Germany - 1949 / 64, interesting collection from First Day Cover in the ring binder. As well Lower House of German Parliament 1949 on First day card, as well 4, 6, 8, 10, 15, 20 and 25 Pfg. Posthorn on two first day letters, Ifraba 1953 on two F.D.C. Documents and so on. Favorable! 1878 Federal Republic of Germany - 1949 / 2000, extensive mint never hinged collection except for posthorn set, Heuss watermark sideways and few further insignificant values complete. 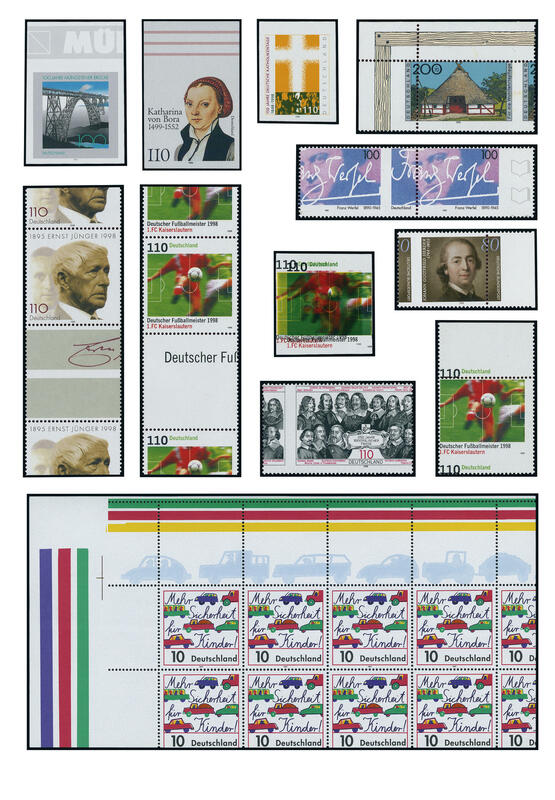 With also Lower House of German Parliament 1949, 100 years stamps, Stephan, all sets helper of human resources, Bach seals, St. MaryÂ´s Church, Heuss 1954, Heuss fluorescent and so on. Michel approximate 5700,- €. 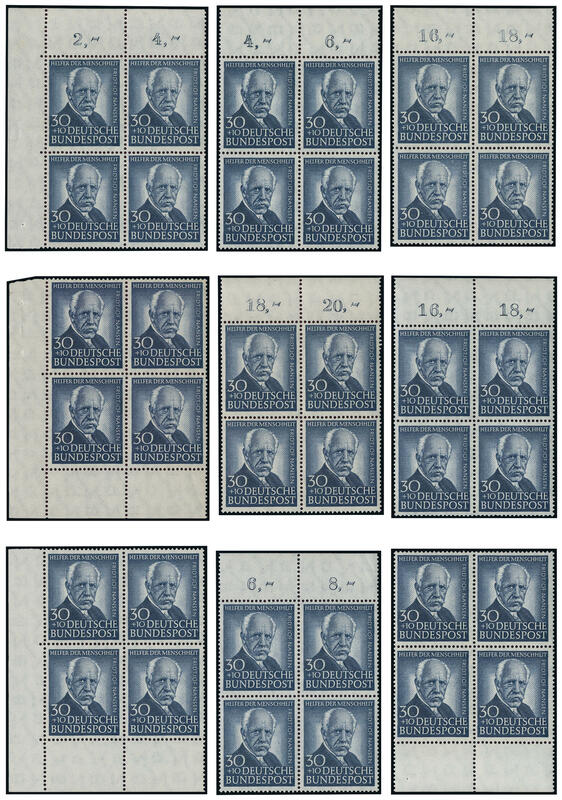 1887 /⊙/ /✉ Federal Republic of Germany - 1949 / 85, extensive collection, a little specialized formed in 10 blue KABE spring back binders. As well are the first issues complete available and all twice collected including posthorn set. Furthermore also numerous se-tenants from posthorn, postal stamps with horizontal pairs and blocks of four, First Day Cover and so on. Also a good part se-tenants Heuss exist, as well good combinations watermark sideways and so on. An interesting and extensive object with enormous catalogue value! 1899 ⊙ Federal Republic of Germany - 1949 / 76, extensive used collection, nearly complete in the Lindner hingeless printed form ring binder. 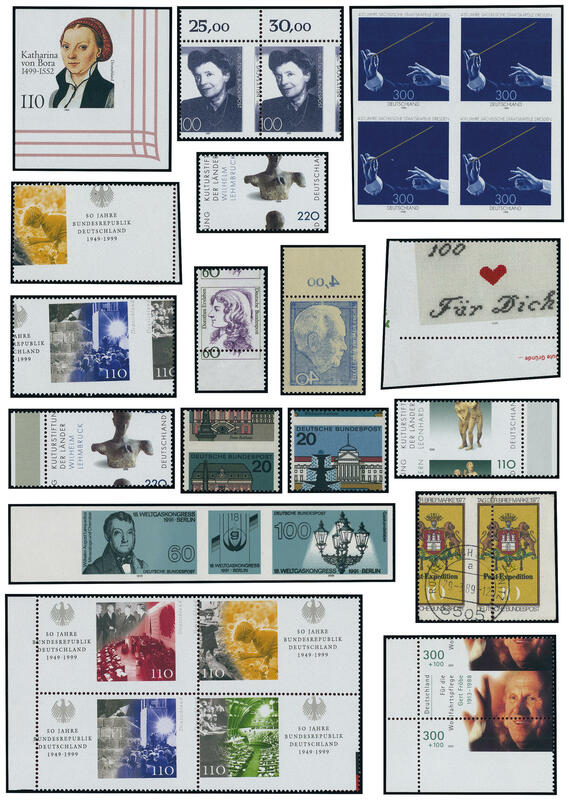 With also Lower House of German Parliament, 100 years stamps, all sets helper of human resources, Bach seals, St. MaryÂ´s Church and so on, often legitimately cancelled Michel approximate 2300,- €. 1925 ✉ Federal Republic of Germany - interesting lot packed in a carton. With also 10 Pfg. Day of the Postage Stamp 1977 three times on covers with additional franking, as well once again unperforated showing a double print in the horizontal pair with additional franking on cover, as well further documents. Favorable valued! 1933 /⊙ Federal Republic of Germany - interesting special lot the welfare issues 1953 in the stockbook accommodated. As well a plethora of complete sets with numerous upper margins and corners of the sheet including blocks of four from the corner and so on. 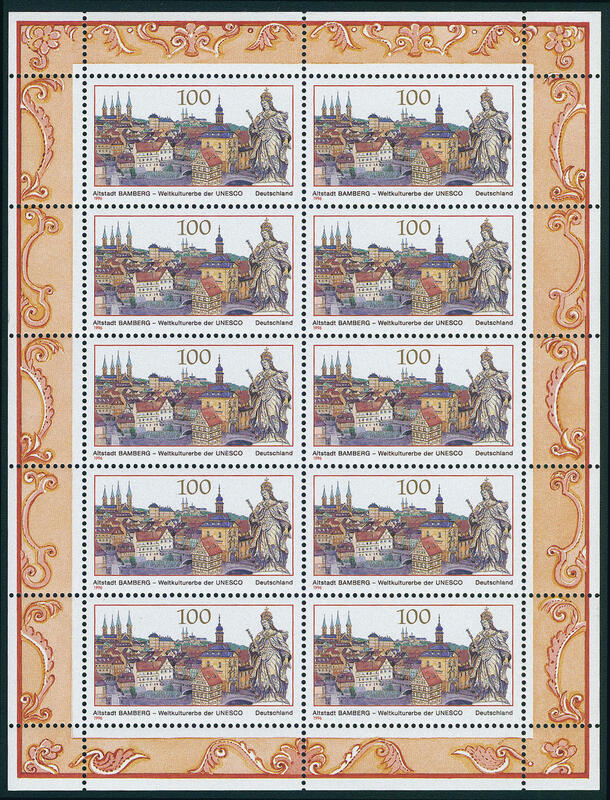 There are alone 13 mint never hinged block of four sets available, as well numerous corners of the sheet. A magnificently inventory! 1939 Federal Republic of Germany - nice and extensive mint never hinged collection se-tenants in the Lindner ring binder. As well a strong part Heuss se-tenants with many better combinations from 1955, good threefold combinations, different advertising imprint, stamp booklet panes, Heuss watermark sideways including all combinations the 8 Pfg. 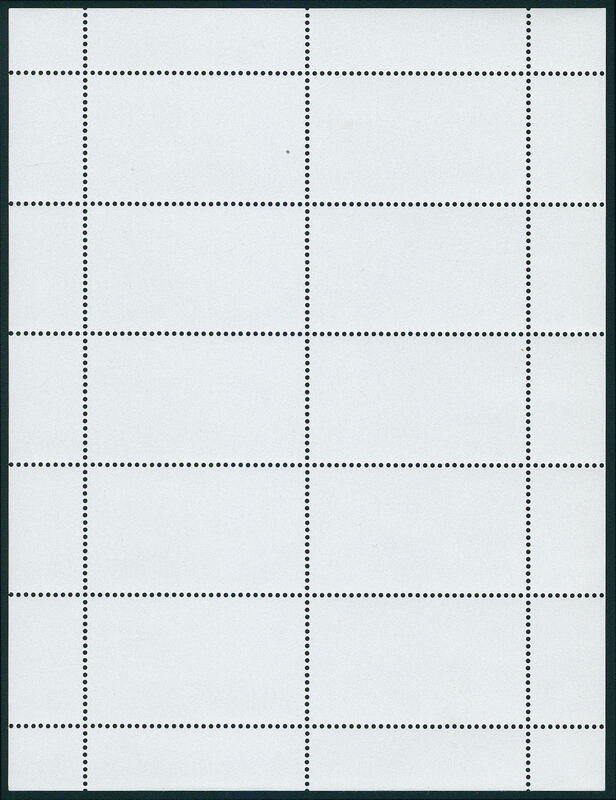 And the stamp booklet pane, as well further issues. Very high catalog value! 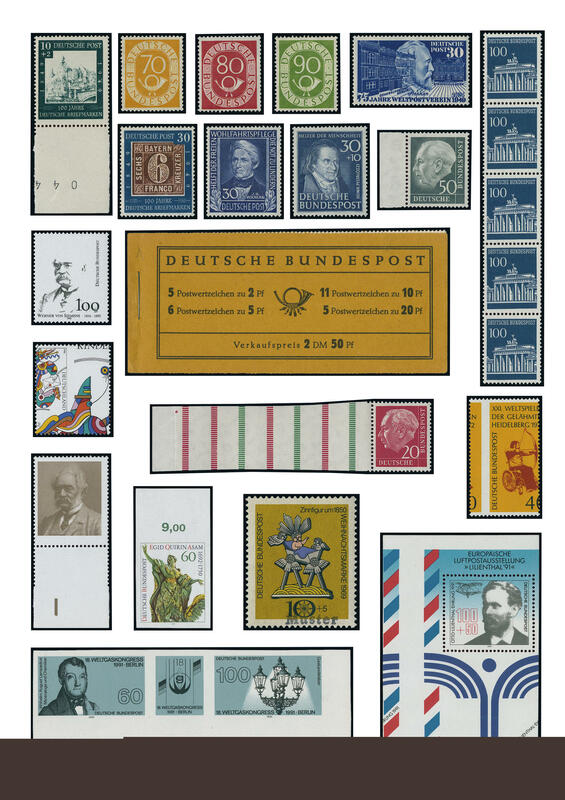 1943 Federal Republic of Germany - 1976 / 97, huge collection from approximate 2700 corners of the sheet, all different in two large thick stock books clean and maintained formed. It were often all fours possible corners of the sheet collected. Furthermore also an enormously part form numbers, partly also with different numbering the same stamp. A very nice object, which lovingly and a high capital expenditure formed was!